June was a kind of slow reading month for me, but I still really enjoyed all the books I read so to me it was a good reading month. Anyways, here are the three books that I managed to read in the month of June. City of Bones by Cassandra Clare – It has been great jumping back into The Mortal Instruments series and I am excited to continue re reading the rest of the series. This is the first book of six, and it follows fifteen year old Clary Fray whose mother is mysteriously kidnapped one day, and she sets off on a journey to find her along with a few new companions. Along the way, she realizes she lives in a world of demons and angels, and that she has more of connection to it than she realized. If you haven’t read this series I highly recommend it because it is such a fun, gripping read! Those are all of the books I read during the month of June and I hope you enjoyed. Don’t forget to check out my last blog post: Reading/Writing Update! 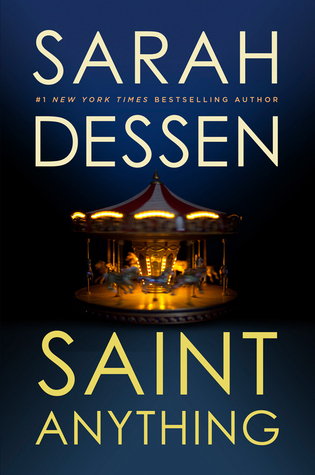 Yesterday, I finished re reading Saint Anything by Sarah Dessen, and I didn’t realize how much I needed to read that book! I was in desperate need of light hearted, easy contemporary that I could just fly through. School has been a nightmare recently since I only have a few days left, and I needed a contemporary to read rather than a fantasy or sci fi book. I am, however, continuing on with Lord of Shadows by Cassandra Clare. I am loving it so far, I am just no able to find the time to read it for hours upon hours. Anyways, I have about three hundred pages of Lord of Shadows left and I am excited to continue on with it! For writing, I think I have written ten thousand words or so…not really sure but I have been keeping up with it! I have not written since yesterday, and I don’t plan to today because I am physically and mentally exhausted, but I am hoping to get a thousand or so words written tomorrow! That is all for my reading/writing update and I hope you enjoyed. Don’t forget to check out my last blog post: Camp NaNoWriMo 2017 Prep #1: Characters! I don’t know about you, but I love to read books that make me feel good. My definition of that is books that have a storyline or character that I can relate to and then I get to see them have a “happy ending”. Reading books like that just makes me hopeful and well, feel good. Here are a few of my favourites and I hope you try at least one out! Saint Anything by Sarah Dessen – I feel like this story is a story that lots of people can relate to. It involves family drama and tension which I think is an aspect in novels that isn’t put in the spotlight enough. Saint Anything is about a girl named Sydney who is used to living life outside of the spotlight, that is, until her brother is arrested. It follows her moving to a new school and making new friends and overall is a really great story that leaves you feeling all warm and tingly at the end! Lola and the Boy Next Door by Stephanie Perkins – This is honestly one of my favourite books ever. The characters are so real and have normal day to day struggles that every single person can relate to. It follows Lola, a unique and expressive girl who is having a great life until everything is flipped upside down when her old neighbour and first love, Cricket Bell, moves back next door. Just One Day by Gayle Forman – I have mentioned this book recently because I just read it not that long ago. Just One Day is a cute, realistic read that shows that not everything goes as plan but that doesn’t mean it will have a bad outcome. It’s about this girl named Allyson who is on a trip around Europe which is coming to an end until she meets a boy named Willem and runs off to Paris with him. They spend an incredible day together until she wakes up and he’s just gone. The book follows her life after that, all the ups and downs, and the undying urge of figuring out why he left without an explanation. Harry Potter and the Philosopher’s Stone by JK Rowling – This is very different from the other books I have mentioned and it doesn’t fit my definition of a feel good book but it just does make me feel good when I read it, and I am sure lots of you can relate. Something about the world and storyline just makes it fit into this category and I just love it. Those are a few recommendations and I hope you enjoyed this post! Don’t forget to check out my last post: Motivating Yourself to Write and I will see you in my next post!